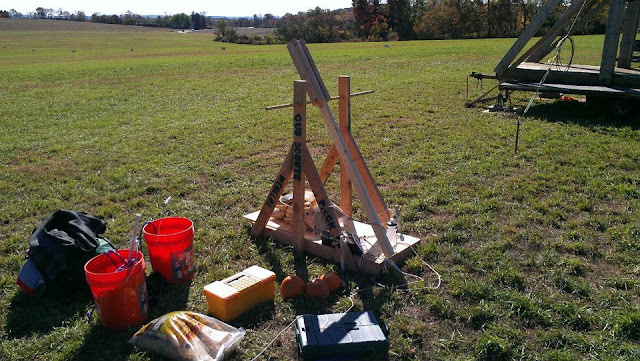 The Pumpkin Sling is now held at Picatinny Arsenal in Wharton. The event I attended was originally held in Warren County, NJ. My review is based on their original location in Harmony, but the spirit of the event is the same! The Last Fling Pumpkin Sling is usually held every Fall. It consists of many different teams (boy scouts, cub scouts, aspiring engineers, students, families, etc.) who have created their own catapult-type machines to see who can "fling" a pumpkin the farthest. If you don't think that sounds very exciting, think again! 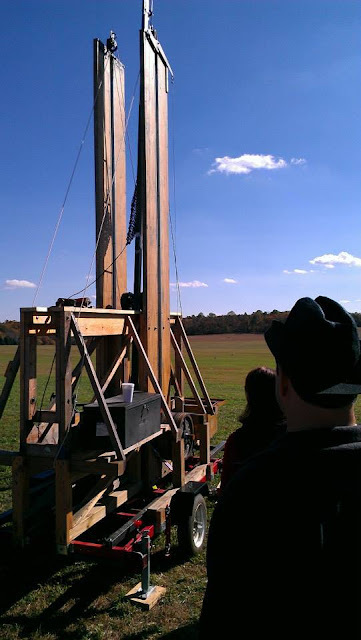 The Last Fling Pumpkin Sling is usually held over two days, so check out their event schedule and decide which day(s) you'd like to attend. This event is family friendly! Dress warm (if it's chilly) and wear good walking shoes. A carved pumpkin from the Last Fling Pumpkin Sling - anyone know who made it? There were vendors the year we attended, and some of them were pretty unique. There was a soda tasting booth that looked like it was right out of the wild west. There were a number of events at different times throughout the weekend, so if you're planning on attending, you might want to check their schedule online to plan accordingly. They had vintage cars, a beer garden, displays, vendors and more. 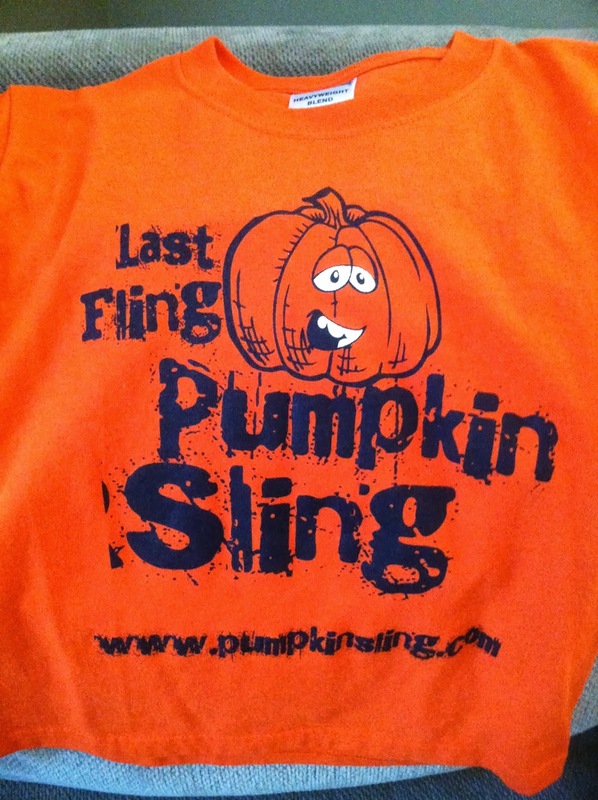 We even bought t-shirts with the pumpkin sling logo on it, which I loved. Now, to the actual slinging. For safety's sake, the machines are quite far away from the spectators, but you can visit them up close when they're not actually slinging. You can read about each team online, as well as their creations, but you can't join them in their slinging area when they're competing. They sling at various times throughout the day, so again, be sure to check the schedule of events in advance. Each group takes turns flinging, and it's fun to watch how far some of them go. It's amazing to see how fast and how far a pumpkin can fly! My son enjoyed watching the quads race out to measure the distance of each pumpkin (there's an attraction between little boys and four-wheelers that I'll never understand). Anyway, it's fun to hear them announce the distance, and there are prizes awarded to the teams in different categories. What's also neat is the machines are given funny names by their creators. Like Stomach Virus and Sir Chunks a Lot. It's fun to see which one of them wins. 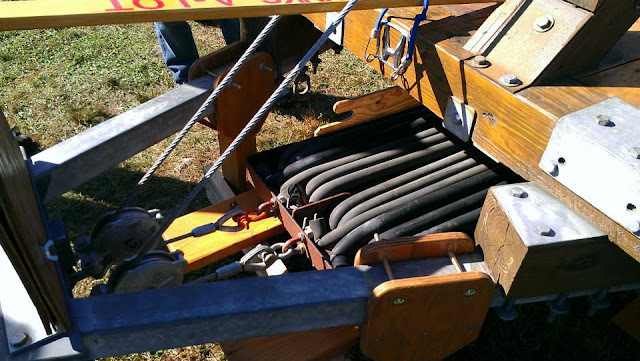 The Last Fling Pumpkin Sling is a unique, fun event for all (and dare I say educational? It's a physics AND engineering lesson, after all!). I love telling people about it, and people always ask about it when they see my son wearing the t-shirt. So fling on over and check them out! *This is an outdoor event, so think twice about what you wear. I'd recommend sneakers with socks or good walking shoes. *It was chilly the year we attended, so we dressed in layers. Did you see the photo of my brother-in-law in shorts up above? He didn't have any complaints, but hey, to each his own. *Review the website for schedule of events, directions (including GPS advice) and times of festivities. *No pets allowed, unfortunately, even though it is an outdoor event. If you're going to bring a stroller, just make sure that it will work through grassy or rough terrain. *Check out the Last Fling Pumpkin Sling Facebook page for more information. Hello! I'm a fellow Jersey Momma. I stumbled upon your blog and love love love it!! Aw, thanks so much!! Well I'm glad you found me and I hope you come back and visit again soon!